The results were reported today in Science. Biologists have long suspected that, unlike many bird, fish and insect migrations that are driven by genetics, ungulates learn to migrate from their mothers or other animals in the herd. Previous research had hinted that migration was socially learned in ungulates, but a clear test had eluded researchers until now. The authors of the study made use of a grand experiment that has been occurring across the American West over the last 60 years. After hunting and disease triggered the loss of bighorn sheep across much of their range, a cadre of dedicated wildlife managers, hunters and conservationists pioneered translocation programs to re-establish lost herds. Bighorn sheep from the few populations that persisted continued to migrate; some of these animals were captured and released into landscapes where bighorn sheep occurred previously. The conservation effort has been successful in establishing many new "translocated" herds. "The pattern was striking," says lead author Brett Jesmer, a doctoral student at UW. "Detailed GPS data revealed that fewer than 9 percent of translocated animals migrated, but 65 to 100 percent of animals migrated in herds that had never been lost." Translocated animals did not migrate because they were unfamiliar with their new habitats, supporting the notion that migration requires extended periods for animals to explore, learn the location of nutritious food and pass that information on to other herd members, including their offspring. When migration and other socially learned behaviors are passed from generation to generation, these behaviors are considered to be part of an animal's culture, much like cultural knowledge shared within human societies. The researchers also were interested in how long it would take for animals to learn to migrate. In recent years, ecologists have learned that ungulates migrate to "surf green waves" of nutritious food, coordinating their movements to graze on plants sprouting along mountain slopes. Much as surfers coordinate their movements to ride ocean waves, spring migration allows ungulates to "catch the wave" of young, nutritious plants that sprout at higher and higher elevation through the spring. This gives them more time to graze on the highest-quality food, helping them to survive and reproduce. For some ungulates, green-wave surfing is highly coordinated across vast landscapes, lasting weeks or months. Jesmer and his colleagues wanted to quantify how long it would take animals to learn how to surf green waves of forage plants in their new habitats, a necessary first step to migration. 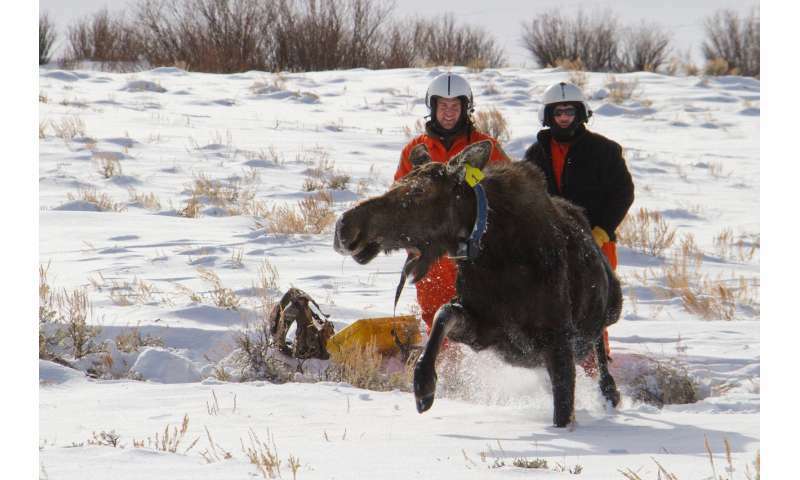 To answer this question, they used GPS collar tracking data from 267 bighorn sheep and 189 moose. Some of the animals had just been released in unfamiliar landscapes, while others had occupied their ranges for decades or even centuries. The researchers found that long-established herds, having acquired information over generations, were better at finding nutritious food than animals translocated to unfamiliar landscapes. Perhaps most importantly, translocated herds learned to better surf green waves over the course of many decades, and those that surfed better were more likely to migrate. 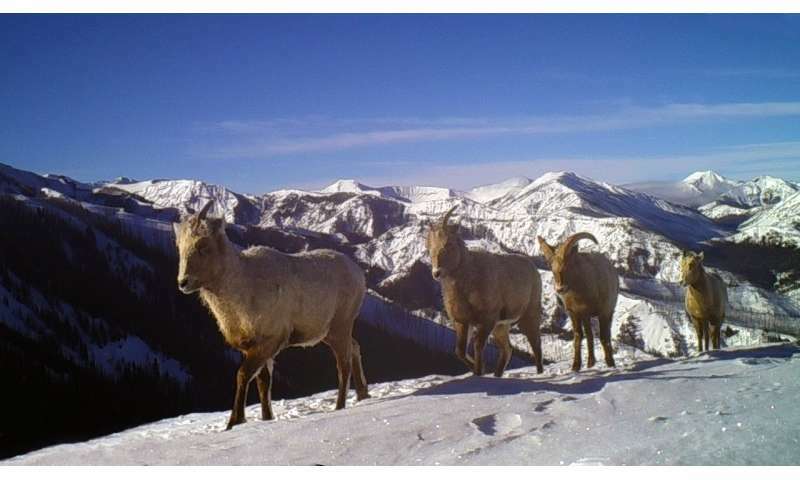 It took nearly 40 years for reintroduced bighorn sheep herds to become 80 percent migratory. Moose generally didn't become migratory until after roughly 90 years living on a new landscape. "These results indicate that ungulates accumulate knowledge of their landscapes over time, and cultural transmission of this knowledge is necessary for migrations to arise and persist," Jesmer says. The study is unique in indicating that habitat quality is best imagined as the physical landscape that animals occupy, in combination with the knowledge they have accumulated about how to use that landscape. That finding has important implications for the conservation of migration corridors, says Matthew Kauffman, one of Jesmer's doctoral advisers and a wildlife researcher with the U.S. Geological Survey's Wyoming Cooperative Fish and Wildlife Research Unit at UW. "When migration corridors are lost, we also lose all the knowledge animals had about how to make those journeys, which will likely take many decades or even a century to re-learn," Kauffman says. "This study clearly indicates that the best way to conserve migration corridors is to protect the landscapes that these corridors depend on today, which will also maintain the cultural knowledge that helps sustain abundant herds."